Welcome Aboard! We're just a family following our dreams, living aboard and cruising where we can. Feel free to follow in our wake as we journey aboard our our 2007 Kadey-Krogen 58'! From there, upon getting the call on VHF 17 that the Ego Alley wall now had room for us (thanks to John, one of the Annapolis dockhands, shuffling boats fore and aft), we squeezed down the alley and docked up in front of the 48' SeaRay express SyJor, as luck would have it, also from BMC. She is berthed in a new-to-them slip across the fairway from us, and we met her owner, Alan, and his kids, Sydney and Jordan, who were enjoying Naptown for the weekend, too. Always fun to meet new folks! And, we ran into Tony from Tourelou, a beautiful 65' Fleming from Canada, whom we'd met in Spanish Cay in the the Abacos last spring and again in West End this year. Clearly, we're on the same cruising schedule!! With the weather clearing and finally beautiful, we'd stowed our road bicycles (Trek Madones) aboard, so Ron and I went riding each day: Saturday afternoon we cycled out to Sandy Point Park (18 miles) and on Sunday morning we had a LOVELY morning ride out to Arundel on the Bay and Bay Ridge, near Thomas Point (19 miles). The trees were greening, the flowering trees and red buds were blooming, the birds were singing in the sunshine...a beautiful morning!! It felt great to be back aboard the bikes again!! We averaged 15.5 miles on Sunday, and were a touch slower on Saturday...but always enjoying the ride! From Annapolis, we had a leisurely cruise back to Baltimore Marine Center in the blazing sunshine; Ally sunned herself on the pilothouse roof while Ron and Karyn navigated and piloted back up the Bay. We got back in plenty of time for Ally to head off to a pool party, then lacrosse practice, then a birthday party (busy schedule). Tonight is quiet night aboard with seafood fra diavolo and a DVD, but right now.... it's 5 0'clock somewhere!! Click on the aquarium above to feed the fish! Hi! We're the Rothsteins. 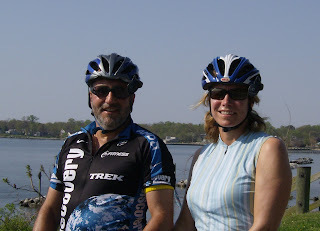 We came from wide-ranging and random points on the compass: Ron grew up in Hong Kong,and Karyn in Wisconsin. We met in Maryland at a small airport on the Eastern Shore -- skydiving. Kindred spirits on land and sea as well, we continue to live life to the fullest! We spent the last 20 years in the Baltimore area working and cruising the Chesapeake, where Ally joined the crew in 1992. Both Ron and Karyn hold USCG 50-ton licenses and are avid scuba-divers, with over 40 years of experience between them. Allison, now 19 and off to college, was certified at age 10 and enjoys diving whenever she's aboard. We're grateful and happy that our family has been able to to live our dream, which is to cruise, explore and experience as much as we can aboard our 58’ Kadey-Krogen, Equinox. We appreciate that we aren’t alone in the desire to explore beyond the known horizons, and enjoy sharing the songlines of others who also relish being out in the world. Fins up! Come join us! From Baltimore to Annapolis and return! Followers -- my thanks to everyone who enjoys reading about our exploits and adventures!